When is the Right Time to Change Your Child’s Safety Seat? Idaho highways and roads can be dangerous for anyone, but no one is as vulnerable in the event of a crash as your small child. You may have spent hours researching the best possible car seat for your child when you first brought them home from the hospital. It’s equally important to make the right choice about when to upgrade your child’s car safety seat to something more appropriate for their age and size. Read below to learn more about when to change out your child’s seat. Safety experts agree that, in the event of a car accident, babies are safest when riding in rear-facing infant seats. Many of these seats have very clear guidelines on the weight at which infants should begin riding in a front-facing seat—often set at 30 lbs—but some infants will become too tall for rear-facing infant seats before they become too heavy. Take a look at whether your child can comfortably extend their legs when in their rear-facing seat to make sure they’re still riding in the right seat. If your child is over one year old, it might be wise to transition to a rear-facing convertible seat, even if they haven’t outgrown their existing seat. 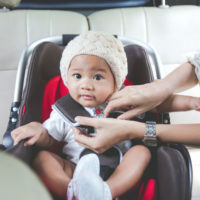 According to one crash study conducted by Consumer Reports, infants over a year old who were involved in a crash hit their head less often when they were in a rear-facing convertible seat rather than a rear-facing infant seat. Car seats incur a lot of wear and tear, especially if they’ve been used for more than one child. If you’ve been using a hand-me-down seat, regularly check the seat’s straps and buckles to ensure that they remain intact. You might not realize it, but if you check your seat’s manual, you’ll find an expiration date for the seat. Manufacturers give car seats expiration dates to ensure that parents don’t continue using seats that might be vulnerable to breaking down. These dates also provide an additional safeguard against parents using recalled seats; a secondhand owner is less likely to have received notice of a recall, but if the parent follows the expiration date, they’ll nevertheless stop using a potentially-defective seat. If you or your child has been injured in an Idaho motor vehicle accident, or your child has been the victim of a defective car safety seat, contact the dedicated and knowledgeable Twin Falls personal injury lawyers at Pedersen & Whitehead for a consultation, at 208-734-2552, with additional offices in Boise at 208-336-2552.